Legacy of Darkness is a Booster Pack, which is an amalgamation of the Japanese sets Struggle of Chaos and Mythological Age. Legacy of Darkness has been released in the Yu-Gi-Oh! 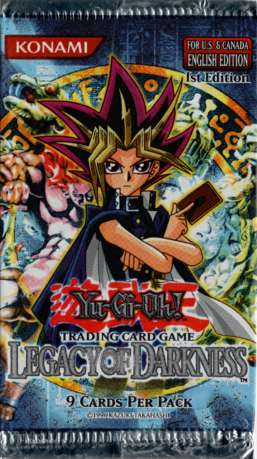 Trading Card Game (TCG) in English and in the Yu-Gi-Oh! Official Card Game (OCG) in Asian-English and Korean. This pack was later reprinted in Master Collection Volume 1 to include "EN" in its Set Number, along with several other packs. Legacy of Darkness introduced the Spirit monsters to the TCG. It contains many Warrior, Dragon and Fiend-Type monsters and support cards. Highly sought after cards include "Yata-Garasu", "Dark Ruler Ha Des", "Exiled Force", "Airknight Parshath", "Fiber Jar", "Injection Fairy Lily", and "Last Turn". In English and Asian-English, each pack contained 5 cards and each box contained 24 packs. In Korean, each pack contained 5 cards.